BANGI, 29 Oct 2013 – Two UKM students who completed their studies but passed away before The National University of Malaysia’s 41st convocation which ended today were given their scrolls on Sunday received by their next of kins. Dr Abd Aziz bin Sabran, a postgraduate student of the Faculty of Medicine, had been studying Community Health Sciences (Occupational Health) when he died before the convocation. His degree was received by his wife Puan Adila. Another student Mustafa Bakri bin Zulkapli would have graduated with his bachelor’s degree from the Faculty of Law. 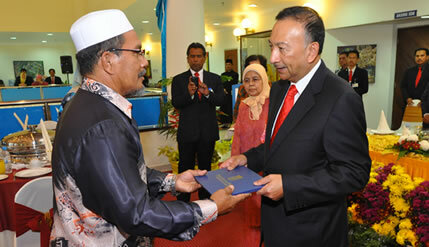 His scroll was presented to his father Zulkapli bin Othman. They were among 6,830 students graduating this year.